This recipe is the complete opposite of my Sunday “Gravy” sauce….no meat or cheese. It’s perfect to use on a homemade pizza, or in seafood dishes because it has a thick and savory base. With a few tweaks this recipe can compliment a variety of dishes. That evening I used some for mussels marina. When I cook sauce I always make a lot. So if you don’t have a huge stock pot, you should….but if you don’t you can always half, or even quarter the ingredients. The cooking technique is most important. Red pepper flakes to taste, personally, I use a 1/2 tablespoon. Its not enough to make it spicy, but enough to know its there. I like red pepper, so adjust accordingly to your palate. Start by heating a stock pot that’s been coated in olive oil. Do not heat so long that the oil starts smoking or you’ll burn your garlic…and burnt garlic is bitter. If that ever happens, simply throw it away and start again. Add garlic and Italian seasoning, heating until fragrant. Stir often. Don’t let the garlic burn. Next, add your tomatoes. I filled one of the cans and used it to rinse both cans of its tomato bits and poured it into the pot. I use a 3 parts tomato to 1 part water ratio. Next, add the pepper flakes and bouillon cubes, heating to a boil. Be sure to stir…a lot. It’s the key to a good sauce because it keeps it from sticking to the bottom and scorching. Scorched and burnt sauce is a terrible waste. I’ve never had any real success with getting the burnt taste out of my sauce. I’ve learned over many years of trial and error, and I’ll admit finally listening to my husband’s advice, and upped the amount of water I use. It gives the sauce something to cook out while all the delishiousness cooks together. Once your sauce reaches a boil, lower your heat just a bit so that it still boils, but not rapidly. A moving sauce won’t burn easy. While your sauce bubbles away there will be a skim that forms; this is a good time to add the teaspoon of baking soda. I sprinkled it on top and it fizzes away. It helps rid the sauce of some its acid. In my meat sauce I would use some carrots, or sugar, but this sauce I want to keep savory, and the baking soda is the perfect fix. I tend to my sauce for at minimum 3 hours. I’ll let the sauce reduce by 3 inches. You can tell by the cook mark around your pot. Your sauce is ready when you can stand a spoon straight up (it may not stay long). Add salt and pepper, then let the sauce sit on your stove, with the burners off, for an hour. I promise its worth the work. And trust me on the pepper flake, it’s not spicy spicy…but it adds a great savory taste. To see how I used this sauce to make a spicy Mussels Marina for that evening’s dinner, be sure to check out this post! 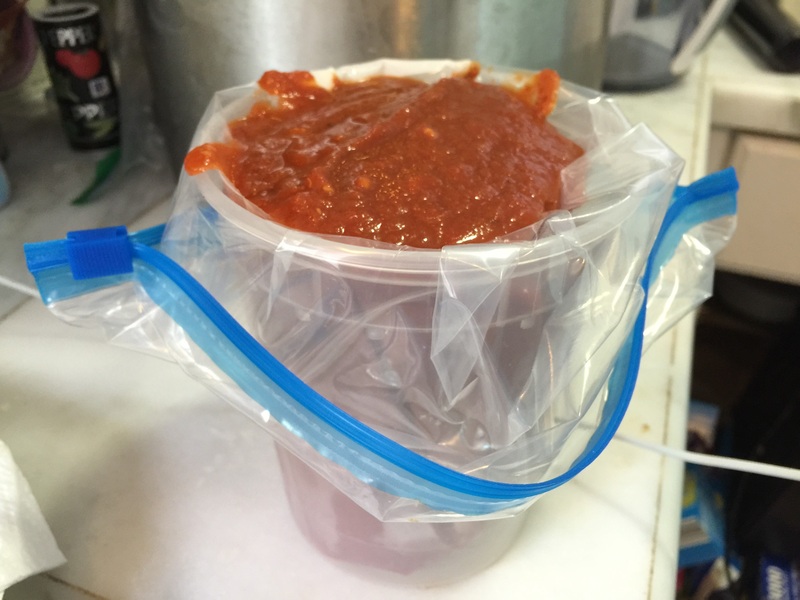 Once the sauce cooled, I used quart sized containers to hold up freezer bags with slider tops. I fill each bag and lay them flat on a cookie to freeze. Freezing them flat helps save storage space!! Use a tall container with a storage bag liner for easy filling! 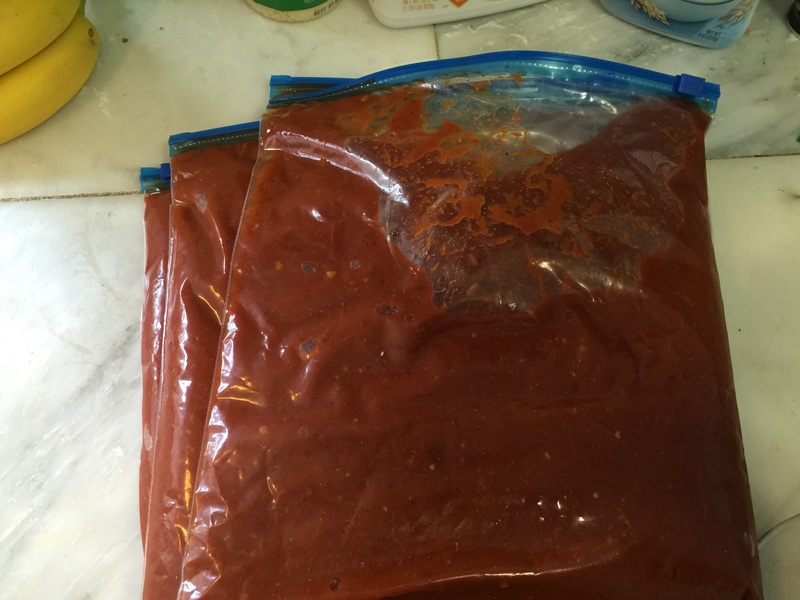 Lay bags of sauce flat when freezing to help reduce storage space!